Clean rooms and laminar flow cabinets | LABOX spol. s r.o. LABOX Company is a leading manufacturer and supplier of laminar cabinets and supplier of clean rooms turn-keys and related technology. 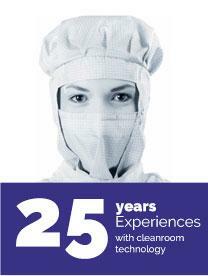 In the area of services for clean room technology offers a professional service, maintenance, measurement and qualification and validation of clean rooms, laminar cabinets, air conditioning, sterilizers, thermostats, incubators, freezers and other thermal techniques. For clean room technology (i.e. an area with a controlled air purity) offers a complete provision of all activities related to the investment that is, from entering through the concretization of the study and implementation project, obtain relevant permits, implementation, putting into trial operation to the qualifications and validation of clean room and installed technology and customer service. Clean rooms and laminar flow cabinets Labox s.r.o. Our testing laboratory provides newly testing, qualification and validation of concentrators. Our testing laboratory provides newly testing, qualification and validation of centrifuges.